Happy Thanksgiving, my friends. There was a different post here earlier today which is no longer up. I accidentally hit the “post” button last night on an unfinished piece that I was working on for after the holiday. Once it was published, I thought, oh well, I’ll just leave it. But reading it again this morning after arriving early on campus to Skype my kids, I decided it was too depressing for this day of thanks. 1. I am thankful for my wonderful family here in Addis Ababa: we really are on a journey, aren’t we? I couldn’t have picked better companions. 2. I am thankful for my wonderful family, the ones who are not here. You’re great just for being you, but I also thank you for all doing all those things for us that we can’t. Remodeling burned up kitchens, handling our bank accounts, taking care of the dog and the chickens and the roses and the persimmon tree, gathering up exotic goodies to send through the mail, installing a new furnace, talking to the lawyers and insurance agents, finding and scanning documents, etc. etc. I wish we were all together today, but, lucky me, I’ll be seeing some of you very soon. 3. I am thankful for my supportive friends, both near and far. I’ve leaned on a couple of you pretty heavily recently. Know that I’ll be there for you when you need me. 4. I am thankful for my job. Most schools will say they put students first; I can say from experience that this one really does. 5. I am thankful to be able to help hungry kids by baking bread, and I am thankful for my bread-consuming colleagues who don’t mind paying more than the going rate to help make that project a success. And one more: it’s not in the top 5, but I’m pretty stoked. I am thankful there was celery at the farmer’s market this morning because now I can make my great-grandma’s stuffing for our big turkey dinner on Sunday! This entry was posted in Family, Home life and tagged Thanksgiving. Bookmark the permalink. At minimum, three people in this world made Grandma Dell’s turkey stuffing this year. Not a bad legacy I think. Yep, I bet she’d be pretty amazed to know that her recipe is treasured on three continents. 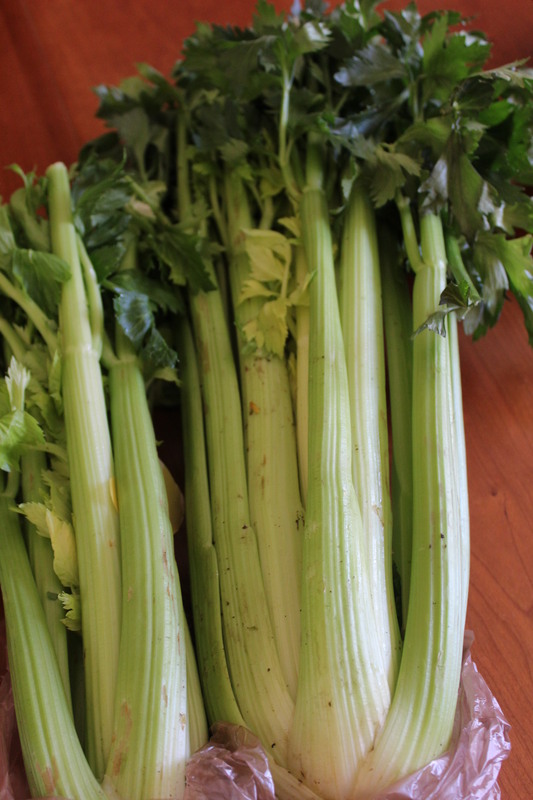 We’ve got to do something about the celery situation, though. It was the most challenging ingredient for both Nik and me!